Published on May 27, 2011 in Analytics, Conversion, General, Internet Marketing, Internet Sales, Internet Tips and Tools, Lead Generation, Mistakes To Avoid, Social Networking and Traffic. 0 Comments Tags: Email Marketing, Online Conversions, See Why, SeeWhy, Social NOTworking. That’s a discussion for another day and one I reserve for my paying clients to help them out-perform their peers by doing out-of-the-ordinary things that create extra-ordinary results. Results that baffle their competitors – BECAUSE they (the competitors) have no clue…. Shhh! It’s called Stealth Marketing and means they can’t copy what you’re doing! In support of my bias, I came across recent reports that continue to show that website traffic from social media networks is still pretty low. 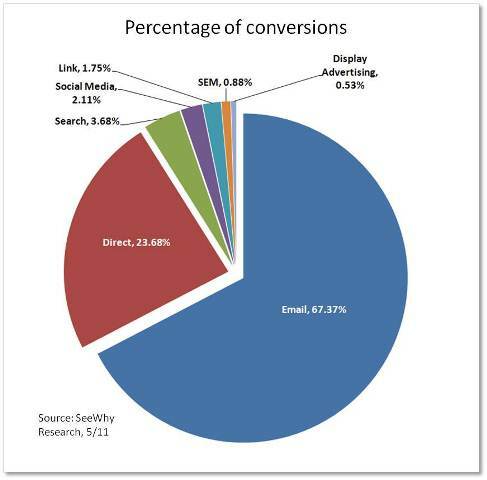 As you can see, email brought in the most traffic, with direct and search significantly less. Social media came in at only 4.3%, not great, but better than display advertising, so that’s something to think about. Next they took that info and charted the percentage of people from each source who completed their transaction. In other words, the people who handed over their credit card number and hit submit. If you want more sales, send more emails! At the end of all of this, SeeWhy does put in the usual disclaimer. Your mileage may vary and different types of ecommerce sites will have different results. 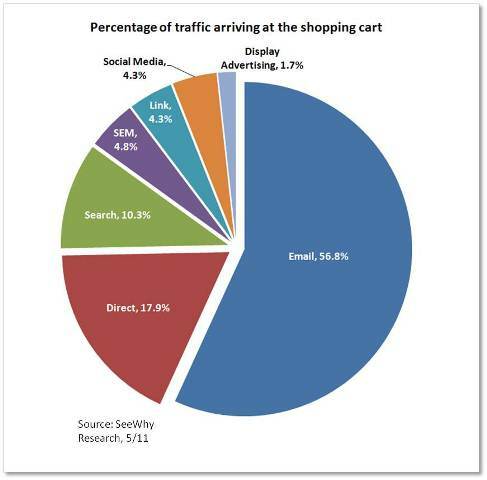 While I understand that this is a study of ONLY 60,000 transactions, it supports my bias that email marketing still is the primary source for online sales. There’s a fundamental reason – it’s a privileged conversation that people still value – as long as it’s not violated. If you’re asking yourself why email marketing isn’t in the news more often, it’s because it simply isn’t as new and trendy as social media marketing. The news “media” are always searching for new trends and buzzwords to fill their empty pages. My clients don’t care about the buzz and hype – all they want is more people buying their products and services. If that’s what you want – send them more emails – but not just any emails… That’s considered spam. You need to know what to send to whom. That’s what we teach our clients to do – become a client today. Contact us now and we’ll help you avoid making mistakes that cost money and lost sales.